PORTLAND, Ore. – Feb. 14, 2018 – Detroit Connect Remote Updates is now available exclusively for the new Freightliner Cascadia® spec’d with Detroit™ engines. With Remote Updates, fleets can now make over-the-air engine parameter changes on one or more trucks and download Detroit Diesel Electronic Control (DDEC) reports without having to physically touch the vehicle. 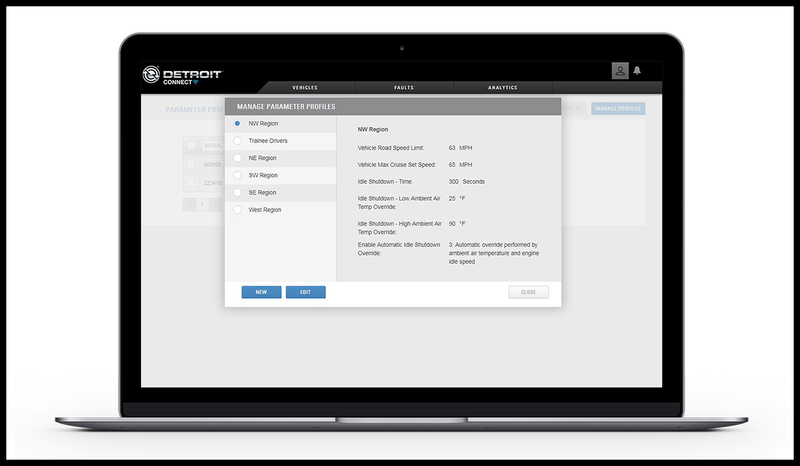 Remote Updates can be easily implemented remotely via the Detroit Connect portal, ultimately leading to improved uptime. Remote Updates allow customers to make changes to parameters on the new Cascadia, specifically road speed, cruise speed, idle shutdown by time and idle shutdown by temperature. It also provides access to DDEC reports, which offer key metrics on driver behavior and vehicle performance. It provides insights on fuel economy, time spent in top gear, time spent in cruise control and more. Remote Updates is enabled by the Detroit Connect platform and is part of the Detroit Connect suite of connected vehicle services, which also includes Detroit™ Connect Virtual Technician™ and Detroit Connect Analytics. All Detroit Connect services are accessible via the Detroit Connect portal. Through the portal, fleet managers can access vehicle fault event and performance data to further deepen their knowledge about their overall fleet health. For more information on Detroit Connect, visit: www.DemandDetroit.com/Connect.